As a material of construction is SS 304, SS 316 ETC. It ensures safety, environment friendliness, corrosion free operation. Energy efficiency is additional features. Due to automation feeding or aeration will not proceed without a Can. The closing end and aeration end oriented accurately. Working Pressure - 0.65-1.0 Mpa. Except for belt conveyor all other equipment will be operated with compressed air or anti-explosive accessories. Liquid filling capacity – 50 – 1000 ml. Gas filling capacity – 20 – 500 ml. Gas consumption – 2 Cu.m/hr. Repeated filling accuracy – 0.5%. Liquid Filling Range 25 ml to 500 ml. Capacity 20 to 40 Bottles/minute. Reserve Storage Tank 30 Ltrs. 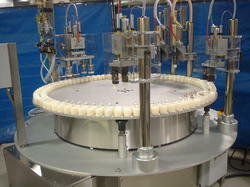 We are one of the leading manufacturers & exporters of Perfume Filling Machine.